Events on in Lake Tekapo with Tekapo Tourism. Below are listings of any events that are being held in or around Lake Tekapo. Please visit www.rivers.org.nz/events/ for up to date details. 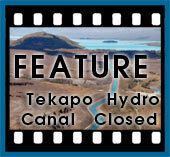 View more information about Tekapo A power station and the kayak course.